Some artists have the ability to stop me dead in my tracks upon first exposure. That eureka moment that causes one to drop everything they are doing and run to the record store or, if you must, the digital music shop. Upon hearing and subsequently freaking out over The Thermals ’No Culture Icons in 2003 I immediately jumped in the car, drove to my local Newbury Comics, and snatched up a copy of the band’s full length debut, More Parts Per Million. 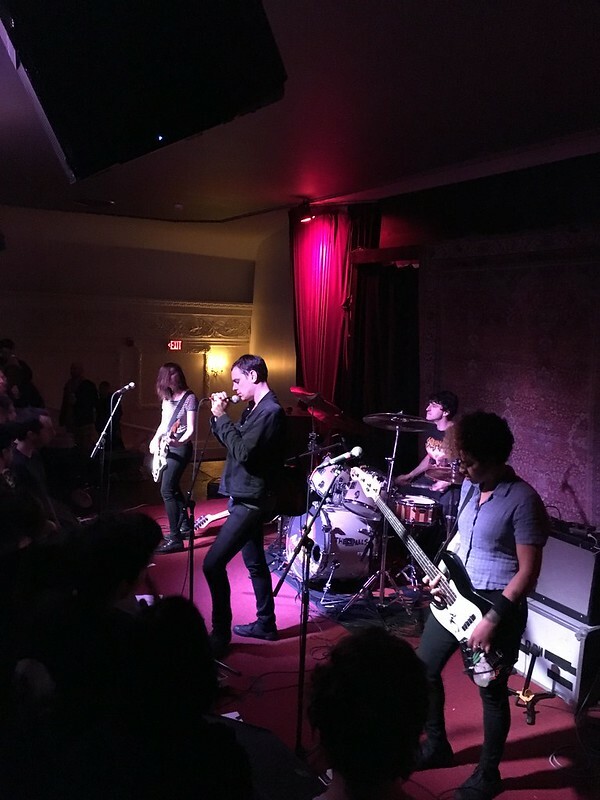 Since that day The Thermals have gone on to release six more LP’s, including We Disappear, which the band recently issued on Saddle Creek Records and are currently supporting on their current U.S. tour. Since re-opening in 2011, Providence’s Columbus Theater has played host to an impressive line-up of national and regional acts, but inexplicably I had never set foot in the 90 year old venue until this past Tuesday evening when Portland, OR’s noise pop outfit, The Thermals made their R.I. Live debut. As I walked into the theater I was ushered upstairs to the intimate 200 seat theater which resides above the venues namesake and 1492 capacity room. After a raucous and impressive set from openers Summer Cannibals, The Thermals took to the stage and wasted little time before kicking off their set with the1-2 punch of Into The Code and My Heart Went Cold from their latest LP. With assistance from bassist, Kathy Foster, Drummer Westin Glass, and lead guitarist Jessica Boudreaux (of Summer Cannibals), Hutch Harris led the quartet through a rousing set of cherry picked tracks from the bands catalog, with particular focus on the new material found on We Disappear as well as their critically lauded 2006 release, The Body, The Blood, The Machine. Having Boudreaux on board only aided the band to unleash dynamic and bounteous layers of guitar fuzz which in turn allowed Harris to ditch his telecaster at times, channel his inner David Byrne and whip the crowd into a frenzy. The set drew to a close with some the bands strongest material, for hair raising performances of Power Doesn’t Run On Nothing and I Hold The Sound. After a short break, The Thermals kicked off their encore with the very song that stopped us in our tracks 13 years ago with just as much ferocity and grit as they demonstrated on their debut, albeit with a little more sweat and swagger.